1.1.��� Kataragama is a unique temple of god Skanda- Murukan amongst all the temples in Sri Lanka. It is a place where all ethnic groups and religious cultures meet. This religious site is claimed ownership by Veddas, Hindus, Buddhists and Muslims. In spite of all the socio-political conflicts the temple continues to survive. The sacred, located in the southeastern region of the country, was once a thick forest-covered area. But its cultural origin is buried in the ancient history. Just as the social history of the country remain a mystery, the historical origin of the temple is also shrouded in mystery. The history of the god at Kataragama is mingled with the social history and ecological environment of mankind (Pettazzoni, 1956). In this context, this study analyses continuity and change in the cult of Kataragama in a socio-anthropological perspective. 1.2.�� The study incorporate both primary and secondary data. The field records collected as a research assistant to Prof. Gananath Obeyesekere and later for my own study are all incorporated in this analysis. It is said that the god came to Sri Lanka from India long ago. 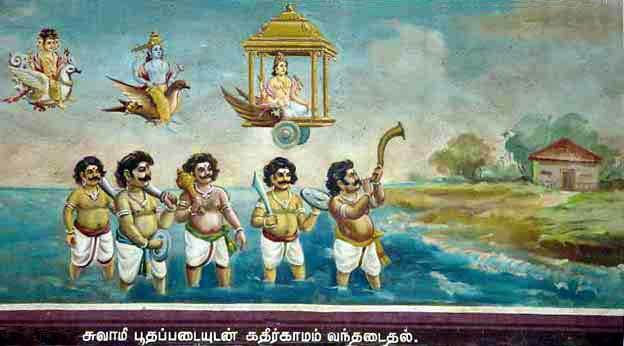 Here, Lord Murugan and His entourage land in Lanka at Katirkamam after crossing the ocean. Temple painting from Śrī Subramanya Swami Devasthanam Kumāra Vayalur, Tamil Nadu. 2.1.The Skanda temple in Kataragama in South Eastern Sri Lanka is a popular temple amongst the different ethnic groups. It is said that the god came to Sri Lanka from India long ago. Every ethnic group in this country -- Hindus, Buddhists and even Veddas -- claim ownership over the temple. Researchers have always been interested in learning more and more about this unique temple, which is in a way a blend of all the cultures in this country. The research into the antiquity and ownership of the temple begins with the place name study. It may be seen that each researcher has been anxious to identify his ethnicity with the temple. The study by Arunachalam (1955: 3) recognizes Kataragama as the favorite resort of Kārttikeya. The region where the temple is located is therefore referred to as Kārttikeya-grāmam. This name in the course of time became distorted as Kajaragama and subsequently as Kataragama. The Hindus refer to this temple as Katirkāmam. The view expressed by Sabanathan (1965: 24) is contradictory to the above. The word Katirkāmam takes its origin from the Sinhala language, which in the course of time became absorbed into the Tamil language as a ticai col (foreign word). This researcher in addition pay emphasis to the katira trees growing in this area and to him it is the Sinhalese who coined the word �Katira-gama', the village with katira trees. Sabanayagam's findings are rejected and refuted by then Pullolyoor Kanapathipillai (1967: 24). Vayan who arrived in Sri Lanka as a bandit with his seven hundred followers from India and who is claimed by the Sinhalese as their forefather, is said to have built this temple at Kataragama for Katirayāndavar in 500 BC. This is referred to in the Yalpana Vaipava Malai. Kanapatippillai argues at the time of Vijaya's entry into Sri Lanka, Sinhala language did not exist and there were no katira trees in this part of the country. Further he laments that it is unfair to claim that this temple for Skanda-Murukan remained without a name until the arrival of Vijaya and the evolution of the Sinhala language. 2.2.The Sinhala Buddhists also have their own views and explanations. They believe that this area was colonized by their ancestors long time ago. Subsequently a sapling from the sacred Bo tree at Anuradhapura was planted by King Devanampiya Tissa and a dagoba was constructed close to the sapling planted. A different view is expressed in the Sinhala folk literature Kanda Upata, in which the temple is said to have been built as homage by Dutugemunu, after winning the battle against Elara, the Chola King from South India, who defeated the Sinhalese kings and ruled a greater part of the country for a long time. It is also widely believed that Kataragama Skanda is the reincarnation of the great King Mahasena. In support of this to date, the main temple at Kataragama is managed according to the Buddhist Temples Management Act. 2.3.� The Tamils have different views to claim their ownership. To them the temple is very ancient and has been in existence from a period, prior to the dawn of the Sinhala Buddhists in this country. The temple according to them existed even before the period of Dutugemunu. �The Tamils built this temple long ago in the Kurincinilam (hill country) at the time they lived in the hills. Even to this day there is no sanskritization and the form of worship is simply �peoples worship', just as it was at the beginning. This can be identified with kantazhai type of worship referred to in Tolkappiyam (Kanapathippillai, 1967). The temple management was originally in the hands of the Tamils, but after independence, when the Sinhalese dominated the political arena, the management was gradually changed hands and the non-Hindus came to be the custodian of the temple. Arunachalam (1908) for the first time demanded that the temple management should be in the hands of the Hindus, but this was ignored. Mahadeva (1938) as leader of the All-Ceylon Hindu Congress stressed for the same. Even this had no impact and the temple management continued to be in the hands of the non-Hindus. To make matters worse, the English daily papers of the time and Sinhala organizations branded the action taken by the Hindus as a racist one, and denied all the rights to the Hindus. The Kataragama Maha-Kapurala, Somipala Rathayake, stands before the screens separating the outer room of the Maha Devale from the inner sanctum. 2.4.� Although the temple management is in the hands of the Sinhala Buddhists, they however could not change the worship patterns and practices that existed for a long time. The puja is conducted by a kapurāla, a shaman priest. The priest performing the puja has his mouth tied with a cloth. These changes have not in any way affected the devotees, who continue to have their own way of worship, make vows in gratitude to the blessings they have received from the god, like kāvati āttam, hanging on a tukkuk kavadi, the carrying of burning camphor chatties and children taking pal (milk) kāvati. Since the 1970s, the Government has taken steps to see that the Tamils do not have any claim in Kataragama. The action taken in the recent times to remove the very symbol Om from the temple gate (Veerakesari weekly 2001) is only the latest. Research studies undertaken in the South indicate that planned changes were introduced to deny the Tamils their rights. Until the time of independence, it is the Tamil priest who played the key role in the fire walking ceremony, but after independence this function was taken over by the kapurāla (Gombrich & Obeyesekere; 1990). These changes, according to them are the direct impact of the socio-political changes that took place in the country. In spite of all these changes, the Tamils have not given up their association with Kataragama. They still continue to go to Kataragama on pilgrimage and participate in the annual festival, exactly as they did before. However, it must be recorded that at times during outbursts of ethnic violence the Hindu Tamils where not able to visit the temple for short periods. It is also true that the majority of Hindu Tamils from the North of the country are not in a position to make their annual pilgrimage, due to the existing �pass system' introduced in Jaffna by the Government and the difficulty in getting a ticket to travel from the North by plane or ship, but those from the East continue the traditional pāda yātrā to reach the temple in small groups. Many of these pilgrims renew old vows or make new ones to the Kataragama God. The Kataragama pāda yātrā commences on the full moon day of May and it is also on this day that kapurālas at Kataragama commence the ceremony with the planting of tree saplings within Kataragama. This is a solemn pledge to bless the annual festival, commencing with the flag hoisting ceremony at the Kataragama Mosque and the water cutting ceremony on the last day. One can, here see widely separated events that spans the length of the island in a dramatic ritual performance that annually recreates the entire mythic story of Kataragama (Harrigan: 1998). Those who are displaced and living in the South make their pilgrimage to Kataragama. Those who cannot and who continue to live in the North derive satisfaction in fulfilling their vows and worship in restructured or newly built replicas of the Kataragama temples in their own homeland. In this regard the, Bala Katirkāmam located close to the historical Saddanatha temple in Nallur is an example. The annual Katirkāmam festival is celebrated here during the same period and exactly in the same way. There are no elephants in the North and Katirkāmam festival cannot be without it. Here they have made a wooden replica of the elephant in full colour, and casket containing the yantra is carried in procession on this wooden elephant, just as it is carried on the back of a living elephant in Kataragama. Here one can say that Kataragama traditions are maintained with the same pomp and fashion in a war torn area, all because the Hindus wish to identify themselves with the God in Kataragama although they are physically hundreds of miles away from it. 3.1.� It is not only the Hindus and Buddhists who associate themselves with Kataragama but the Veddas also claim the same or even a right to the temple. It is not certain for how long the Veddas have occupied this country. It is possible they walked to Lanka from the Asian mainland during one of the ice ages when sea levels were low enough to expose Adam's Bridge as late as seven thousand years ago (Harrigan: 1998). The hill country where the temple is located and the adjoining forest covered area is the homeland of these Veddas who claim kinship with the God at Kataragama and Valli his local wife. "Valli is my sister, Murukan is my in-law. We are descendants from Valli's clan. It is our duty therefore to participate in the annual festival, of the God who married Valli. Once my father was insulted by the temple chief, since then out of grief I did not go to the temple nor participated in any of the functions. Perhaps it is the wrath of my father that subsequently killed the temple chief, in the meantime my father also died. A year after this, when I was asleep in a dream Valli appeared and asked, "Why are you here? The annual festival for your in-law is being celebrated. Go to the temple and pay your respect to him!" saying this Valli disappeared. As I awoke up from my deep sleep I realised that the annual festival was to commence the following day. Gathering courage, I walked towards the temple to perform our duty to our law. This I do since 1991. Now I am given full respect from the temple authorities. Once the festival is over, I return to the forest to live my Vedda life". This was told with emotion by the present Vedda chief Bandilla Hethos (1997). This tale by the Vedda elder is an expression of the close kinship they claim with the God through Valli. The antiquity of the temple can only be fully understood, not from the feelings of ownership claimed by the Tamil Hindus and Sinhala Buddhists, but from the Veddas and the worship practices they follow at this temple. It is probably their customs and cultural practices that continue to be practiced and that which bring the different ethnic groups together in one common place of worship. It is only through this that the antiquity of Kataragama may be appreciated. In spite of the fact that every ethnic group identifies itself with the temple, they recognize the kinship of the Veddas to the Kataragama God through Valli. 3.2.�� The Sri Lankans belief that it is at Kataragama god Skanda secretively married Valli. The Hindus belief that after the defeat of Curan the demon, Murukan came to Sri Lanka to marry Valli. 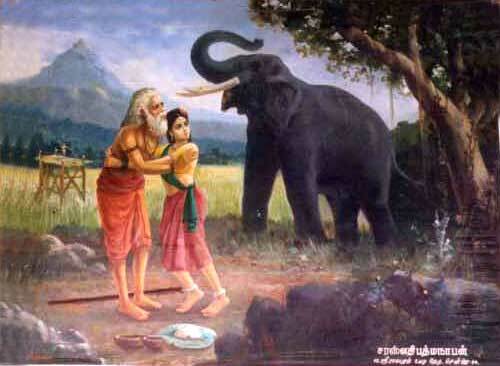 Valli was also determined to marry Murukan, but Murukan came to the tinnaippulam in the form of a hunter and then as an old man and Valli did not accept his advances. It was Ganapati, Murukan's brother who came to the god's help disguised as an elephant to frighten Valli and compel her to marry Murukan. At Sella Kataragama, about three miles from Kataragama, is a temple for Ganapati. It is here the above episode is said to have taken place. Tirumurukārruppatai, a famous work of classical Cankam literature, refer to a fifth house (temple) for the God Murukan. It is widely suggested that Kataragama may be this temple. 3.3.� The Sinhalese too accept the marriage of the Kataragama god to Valli, but they do not preserve a tradition of the god's battle with Cūr, the demon. They further believe that the battle was fought by the god against the Veddas to conquer Valli. In this battle all the Veddas were killed and the grieving Valli complained to the Kataragama god about this and the god out of sympathy for Valli sprinkled holy water from the Manika Ganga and brought the Veddas back to life. From that day onwards, the Veddas have accepted the god as their leader and offer him honey and tinaima (millet flour). At present a new myth is spread amongst the Sinhalese by people like Hepetipola Sāmi. According to this, Murukan did not kill Cūr but killed a Tamil leader by the name of Asuran. In fact these myths are recent insertions which deny any claim to ownership of Kataragama by the Hindus. The myths that are prevalent amongst the Veddas, Tamils and Sinhalese are not taken into any account by South Indian scholars. They believe that the wedding of Valli and Murukan took place at Valli Malai near to Tiruttani (Vellore district), a version of the myth that is widespread amongst South Indians. This myth has in no way affected that of Sri Lankans who believe otherwise. The North Indian myth of Skanda-Teyvayānai marriage was introduced at a later stage to establish Skanda as their God and Teyvayanai as their Goddess. Teyvayānai was very angry when she came to know that Skanda-Murukan had left her to marry Valli in Sri Lanka. She traveled to Sri Lanka and persuaded him to return to India but failed. She therefore decided to stay back in Sir Lanka along with her Lord and her junior co-wife Valli. In Kataragama, there are separate temples for each one of them. 3.4.� It is true that the problem was solved by having three separate temples yet Valli Amman receives special affection and importance at this temple, for during the annual festival the procession, along the outer court yard is always taken in the direction of the Valli Amman temple while Teyvayanai Amman temple is completely ignored. The night before the last day of the festival, i.e. the water-cutting festival, the God is taken to Valli Amman temple in procession to the accompaniment of music and dance and joy and happiness expressed by the devotees. The same practices in Murukan worship can be seen in Tami Nadu and in Batticaloa, the Eastern part of Sri Lanka. Mandur in Batticaloa, referred to as �Cinna Katirkāmam' and Ukantai Murukan Kovil can be considered as good examples. At Ukantai there is no place for Teyvayanai Amman. 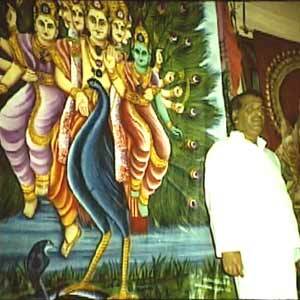 Velluppillai (1984) refers to the Murukan temples in Batticaloa as reflecting the Kataragama cult. Research into the worship of Kumarattan or Kumāratambiran in this region projects the same socio-cultural conditions and the physical environment in which these temples developed, namely the hills and the forest-covered region (Shanmugalingam: 1998). There too Vedda puja plays a dominant role. Today this ancient Murukan temple is very much sinhalised, yet for all the kapurālas are accepted. 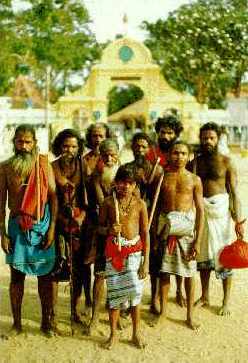 They claim with proud feelings that they are the descendants of Valli Amman. It must however, be accepted that there are certain changes taking place as to the identity of the kapurālas. A few of them claim to be the descendants of Nandi Mitra, a soldier who fought the battle against Elala along with Dutugemunu. During the time of the British governor (1819), the right of the temple puja was given over to the kapurālas. The object of worship and the practices at Kataragama are quite different to those taking place in the traditional Hindu temples. Here the object taken in procession during the annual festival remains a mystery. 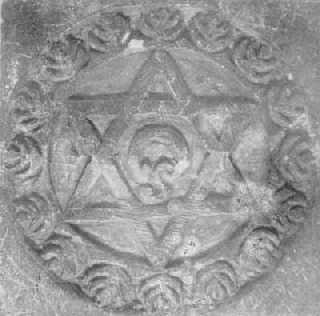 It is believed that a metal plate engraved with the sadkona yatra (hexagram) is the object that is placed in a casket in the sanctum sanctorum. Alternatively there is also another view that the figure of Arumuka Swami carved out of red sandalwood and gold plated, is the object of worship. Ulvita who functioned as the Basnayake from 1922, Punchisingho who served the temple until 1934 and Kataragama chief shaman priest all stand witness to this to (Nathan 1965). There is also a recent myth that the yantra sent by Teyvayanai to attract Skanda back to India is the one that is placed in the casket in the sanctum sanctorum. It may thus be recorded that even to this day, the object contained in the casket remains a mystery. The priest performing the puja ties a white cloth around his mouth, places the offering inside the sanctum sanctorum, and then takes a position in front of the curtain which carries the picture of the Kataragama god and his two wives. It in this position he performs the puja. The devotees never get a chance to see what is going on in the sanctum sanctorum. It is strange, to this day no one has ever questioned as to why the puja is conducted in this manner, strange to what happens in other temples. In fact this has spread to other parts of the country as well, particularly the Eastern region. The Vedda community plays a prominent role in all the activities of the temple. 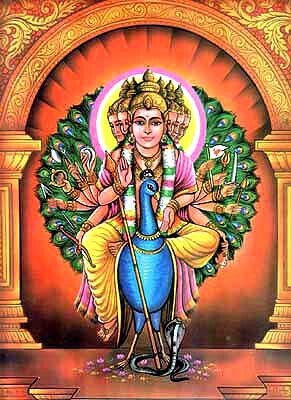 The devotees and those associated with the temple accept the Vedda community as the direct descendants of Valli, the sweetheart of Murukan. Thus one can see the continuity of the importance of the Vedda community in Kataragama. This is an indication of the continued acceptance of the Veddas as descendants of Valli, their customs are intricately mingled with all the activities taking place at Kataragama. The research carried out by Parker (1909) and Seligmann (1911) expressed the view that the customs and traditions of the Veddas at Kataragama are identical to those of the Tamils who inhabited Kurinci Nilam. The Sri Lankan vana vedar, the forest dwellers, consider the Gale Yaka, a spirit dwelling in high rocks, as one of their gods and worship him. The Veddas along the North Eastern coast patronize malai pey (spirits of the mountain) Malaiyan (spirit of the mountain), and Malai Cāmi (mountain god) among their objects of worship. At the same time the Veddas from the central part of the country are associated with Kataragama (Parker, 1909). The Veddas totally rejected the planned effort by the Government to absorb them into the national stream and they continue to cherish their ancient customs and culture, and maintain their deep-rooted attachment to Kataragama (Stegeborn 1997). 4.1.� First and foremost this study reveals, that in spite of the different ethnic groups claiming relationship with Kataragama, the shrine stands today above all as a centre for worship for all the ethnic groups in this country, including the Hindus, Buddhists, Muslims and Veddas. 4.2.� The origins of myths always have a social inclination, according to Mallinowski. His ideology is reinforced by the myths associated with Kataragama. In spite of the conflicting history of the different races in Sri Lanka, political changes are explicitly brought out through these myths. Pens (1912) put forward the idea that Kataragama and its centre of worship are much older than that of Buddhism. This to him is clearly exposed by the carefully planned myths introduced at different times while expressing the history of this temple. 4.3.��� Kataragama's traditions are closely liked with the traditions of the Veddas. Moreover, they have also embraced the ancient customs of the Tamils, e.g. the theme of secretive love marriage. The Tamil name Valli is a clear indication of the closeness of Kataragama with the Dravidian Tamil culture and customs. It is later (i.e., after the blend of the Aryan traditions) that Murukan came to be associated with Teyvayanai and known as Valli-Teyvayānai sameta Shanmukap Perumāl. This is very well illustrated in the epic Kanta Puranam. In spite of this, the individuality of Murukan as the Tamil God is maintained at Kataragama and in Batticaloa where Hindus predominate. It is interesting to note, however that along with the present worship patterns and practices, the Tamil form of bhakti worship predominates at Kataragama. 4.4.� The waves of bhakti demonstrated by the different ethnic groups override the political turmoil that has affected the country in recent years. This is a way by which different ethnic groups are brought to the same place of worship at Kataragama. This, it is expected, will continue for many more years to come. At one time certain mischief was spread to say that the different forms of penance like walking on wooden slippers with pointed nails, hanging on the tukkuk-kavadi, walking on red hot fire are all performed to punish the Tamils (Seneviratne 1935). It is interesting to note that, until recently, tukkukkavadi was performed neither by a Tamil nor a Sinhalese but by a Muslim by the name of Careem, year after year. It is true that control of the fire-walking ceremony is in the hands of the Sinhalese, but devotees from all communities walk on the red-hot fire and fulfill their vows. The Buddhists do abhor and condemn such actions in any place of worship. Yet ironically, as heads of the ceremony, the Sinhalese (including Buddhist monks) are present to officiate and give their blessings before the commencement of the fire walking. It is strange that Hindus with all their agamic traditions, used to accept the offering of venison at this temple. This offering is prohibited with the introduction of the �Temples Act'. Kataragama is a place of worship, where the different ethnic groups have learnt to respect the culture, customs and feelings of others. This is the basis and hope for the continuity and importance of this temple for many more years to come. It may therefore be said that the acceptance of one another's religious customs and beliefs have immensely contributed to the stability of Kataragama's traditions. It is the hope of the devotees that Kataragama will continue to exist just as it is now forever. The waves of enmity meted against the minority Tamils by the middle class Sinhala majority at Kataragama could not last long and could not be rooted amongst the Sinhalese themselves. 4.5.�� The religious scenery at Kataragama is changing. The visitors to this temple until recently came as pilgrims only, but now a large number come as casual tourists. A fair number of school-age boys and girls come to this temple, not to worship but to make romance and have fun. It has been recently noted that alcohol is consumed and they pass nasty remarks at those who come to worship. This has inevitably eroded the consensus among pilgrims. Until recently Kataragama retained its sanctity and mystery but it is now a place with a carnival-like atmosphere. The more devoted pilgrims regret this progressive secularization. They hope against hope that it will be a passing change and that the old Kataragama traditions will be retained. Some devotees believe that it is the will of the Kataragama God, who after so many centuries remains alive and well and mysterious as ever in his ways of relating to humanity (Harrigan, 1998: 33). The very location of the temple in the midst of dry rocks, the dry zone forest cover and the bhakti environment at Kataragama has prevented the political changes taking place in the rest of the country taking root in the temple premises. 4.6.�� Finally it should be stated that even before the megalithic culture, people with their hunting and food gathering habits, probably with different social customs, worked together as one unit to establish the sanctity and practices of Kataragama. This place today is a centre of worship for different ethnic groups. Here one can see a blend of different customs and cultures. This it is believed will enable the temple to withstand the waves of political changes and continue to be a place of worship for many more generations to come. "Skanda-Murukan cult in Eastern Sri Lanka: Continuity and Change"